This is the Norwegian paperback edition of Sacred Clowns, the eleventh Tony Hillerman Navajo Mystery novel featuring Joe Leaphorn and Jim Chee of the Navajo Tribal Police. This edition was published in 1996 by H. Aschehoug & Co. in Olso, Norway. 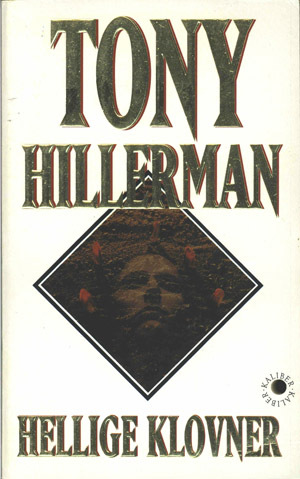 This edition is part of the Kaliber series and is a reissue of the 1995 hardback edition. The text was translated into Norwegian by Atle Bjørge and the cover photo is by Espen Tollefsen. There is also a hole that penetrates the entire book on the lower right hand side of the cover with KALIBER written twice around it. Binding: Paper covers with full color illustration. The author's name, title and series logo are printed vertically on the spine.